I had no idea what that was yesterday. Really! Ironic, I know. 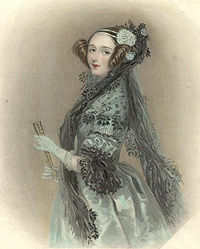 Well as it turns out, Ada Lovelace is widely considered the ‘first programmer’ – and a virtual one at that – for her work with Charles “Father of the Computer” Babbage’s ‘analytical engine’ concept. Had they actually built it (in 1991, a working model based on original plans proved that the concept would have worked), it would have been the first computer, and Ada would have had it humming along happily. In honour of the day, people all over the world have been asked to blog about their female technology role models. For me, the woman who truly exemplify the spirit of technology, innovation, and furthering the role of women in science and technology is Marie Skłodowska Curie. She was the first women to receive a Nobel Prize. The first person to earn or share two Nobel Prizes. She is only one of two people to be awarded Nobel Prizes in two different categories (Physics and Chemistry). Linus Pauling is the other. Despite all that, the French Academy of Sciences still refused her membership. She helped put her sister through college in Paris, after which her sister returned the favor, where she earned a physics and subsequently a mathametics degree from the Sorbonne. She always loved her homeland of Poland, even though they refused her a position at Krakow University because she was a woman upon completing her schooling. She encountered numerous instances of prejudicial treatment in the science community, and always managed to rise above it. She discovered polonium. She named it after her homeland of Poland. Together with her husband, they discovered radium. Their work in radioactivity (a word which the Curies coined) was groundbreaking. Marie learned quickly that she had to lay claim quickly and clearly that her ideas were her own, however, or the scientific community would write her off as just her husband’s assistant. Despite how devestating it was, her husband’s death 12 years after they met helped her to establish herself as a scientist in her own right. The woman was amazing. After her husband’s death, she became the first female professor at the Sorbonne, and continued their work in earnest. And her work is what eventually killed her – she eventually died of a type of anemia directly caused by exposure to radiation. But because of her work, basic laws of physics and chemistry were challenged, the nuclear atom and ways to battle cancer were discovered, and the role of women in sciences was forever changed. Here’s to Marie Skłodowska Curie, and Ada Lovelace. May their stories and efforts continue to enrich the lives of women, and everyone. This entry was posted in Geeky stuff and tagged ada lovelace, marie curie, women in tech by Morgan. Bookmark the permalink. When the subject of women in science comes up, I always tip my hat to Dorothy Hodgkin (1910-1994). Ms. Hodgkin was a pioneer in the field of x-ray crystallography, and used the technique to determine the chemical structure of many chemical compounds, this at a time when women in science were still fighting an uphill battle for recognition and respect. In particular, Ms. Hodgkin was the first to determine the molecular structure of Vitamin B12, for which she won the Nobel prize. In the process, she showed that Vitamin B12 contained a cobalt-carbon bond, which was pretty much unheard of at the time, and which helped create the field of organometallic chemistry (a field of study near and dear to my own heart). God bless, Ms. Hodgkin. Wow, she was truly an amazing scientist! It does seem that most people’s female role models tend to be ones that did amazing work in the person’s field of choice. Which leads me to wonder; I can’t think of any female role models in another field of study near and dear to my heart: astronomy. First person I think of is Tyco Brahe when it comes to that field. And not so much because of his accomplishments, which were amazing, but because I think his name is just cool, and of course the losing your nose in a duel thing. Time to find some more amazing women! en heduanna – Babylonian, chief priestess of the moon, sectioned off the sky into 12 segments for studying. nicole lepaute – super rich chick from a wealthy family who was an amazing calculator and predicted the exact time that halley’s comet would reappear in the 1700’s. theres a moon crater names after her. annie jo canon – classifying stars wiz. fun stories about her being on the top of her father’s new england house if i remember correctly.